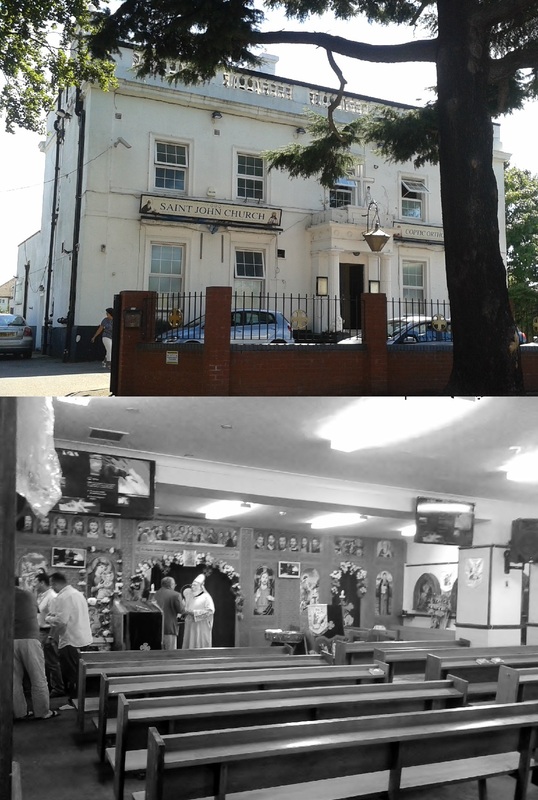 The parish currently worshipping at St Gregorios Church was founded in 1974, established by a community which had roots in groups of Indian Christians brought together by priests and bishops of the Indian/Malankara church visiting Britain in the 1930s. In 1978, the community began to hold services in an Anglican church in central London, and bought St Gregorios Church in 2005. The building was originally a church hall for the nearby Anglican church of St. Peter, and “St. Peter’s Hall” is still visible on the window above the main door. The outside of the church is not particularly striking, but then again, it was originally simply a church hall. The inside, though, certainly looks the part. Walking into the church, the first thing I saw was a large brass cross in the middle of the aisle between the chairs, which had candle wicks burning from what reminded me of tiers on a wedding cake, bowls of oil around the cross which got larger the closer to the floor they were. Facing each other on opposite walls at the back of the church are two realistically painted icons, one of the Virgin Mary with the baby Jesus, and another of whom I presume is the eponymous St. Gregorios (1848 – 1902). These have candles and incense sticks placed in front of them. An archway near one of these icons leads to a small dimly lit side-chapel with icons of the Virgin Mary. At the front of the church is the sanctuary, which had a red curtain drawn across it when I entered. This is flanked by copies of the two icons at the back of the church, as well as by some floral displays. A small stone font and an electric keyboard are also at the front of the church. For much of the service, the curtain in front of the sanctuary was drawn to reveal a spectacular three-tiered altar, draped in red and gold cloth, with crosses on each level flanked by twelve candles and with the Rublev icon of the Trinity placed in the middle. Above the altar is a stained glass window showing St. Thomas the Apostle encountering the risen Christ, with angels on either side of them. The service was led by a priest who for much of the service wore rich red and gold vestments, although before the start of the Qurbana (see below) he was wearing far simpler black vestments. He was helped by ten younger men in white vestments, who were altar servers, deacons, and/or chanters. An elderly bearded man in black was also up in the sanctuary but did not seem to play much of a part in the service; I think he was a visiting priest. The congregation was huge. It was too large to count, but there were certainly more than 120 people there, maybe up to twenty or so more. Unsurprisingly, the congregation was Indian in terms of ethnicity; indeed, I was the only non-Indian there! There was a roughly even divide between males and females, who, just like in the Coptic church I visited last month, were segregated by the central aisle. There was also a wide range of age groups. There were two main parts to the service: the morning prayers, and then the main communion service (the Qurbana). The morning prayers started at 9:00, and were sung in Malayalam, an Indian language. The prayers were divided into verses, alternating between the chanters and the male members of the congregation singing one verse and the female members of the congregation chanting the next. I was able to follow these prayers due to service books situated in the back of each chair, but there was no translation, only a transliteration into the Latin alphabet. Nevertheless, despite not being able to understand this first part of the service, I was at least able to just about follow it, although twice I lost my place in the prayer book and was kindly shown where we were by a member of the congregation. After the morning prayers came the communion service. This was in English and found in another service book, with a large part following the same pattern of prayers and hymns alternating between being sung by the men and women. According to the service book, they were using the Liturgy of St. John Chrysostom (the standard liturgy of the Orthodox Church) but it bore only a vague resemblance to it, and most sources I have found say that the Indian Oriental churches use a modified version of another liturgy, that of St. James, so I am unsure precisely what was being used here. The Qurbana began with the curtain over the sanctuary being drawn back, and a very loud bell at the back of the church being rung several times. I was seated quite close to the back, and I found this bell so loud that after a few peals I actually had to cover my ears. The Qurbana service consisted primarily of the prayers and hymns sung by the congregation, with use of incense and hand-held bells by the altar servers. Some of the hymns were accompanied by synth sounds from the electronic keyboard. Bible readings were Genesis 42:6-16 (Joseph meeting his brothers as governor in Egypt), 1 Kings 3:5-14 (Solomon being granted wisdom), and passages from Matthew 16 and 1 Corinthians 3. Twice before communion, members of the congregation queued up to go up to the priest and receive a blessing. Communion itself was given by a spoon from a chalice, as in Orthodox churches, and as at the Coptic church I visited the men went up to receive first and were followed by the women. The Qurbana lasted just over two hours, and was followed by the sermon. This wasn’t very long, and was on the subject of being thankful for God’s blessings. After this came some announcements, mostly concerning the harvest festival being held after the service, as well as an “introduce the newcomers” section during which myself and several others had to stand up and briefly greet the huge congregation – not one to enjoy being the centre of attention, I found this rather intimidating. After more notices and announcements, the service finished at 12:30, having lasted two and a half hours in total. After the service, a few members of the congregation sang a song to music being played over a sound system, during which the congregation – again segregated by gender, but this time females first – approached the front to receive a blessing from the priest. The church’s annual harvest festival was being held in a hall adjacent to the main building, and most of the congregation left via a side door to go to this, where traditional Indian cuisine was on sale. The church building was opened in 1928 as the Anglican church of St. Francis (serving a parish founded in 1906), but was declared redundant and was sold to the Coptic church in the late 1980s. 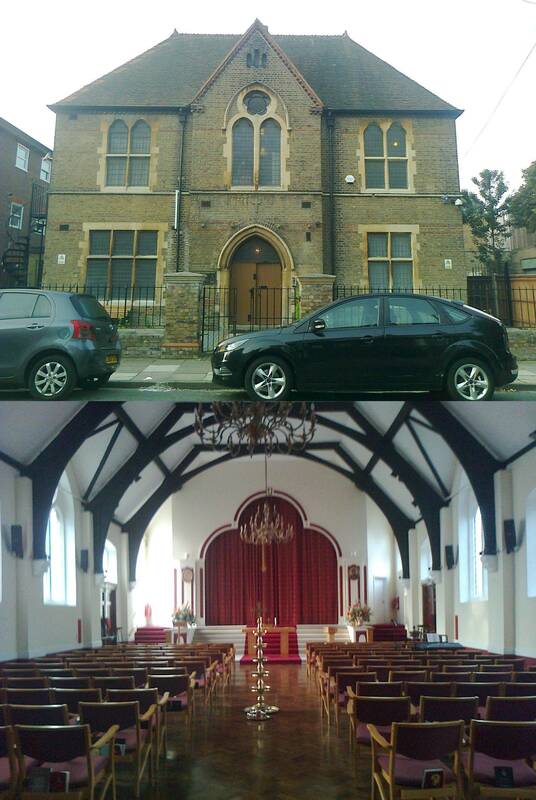 The current parish is one of the oldest Coptic churches in the UK, being established on 11 January 1988 as a sister church to one in Kensington in order to serve the growing Coptic community. The church is a long, brown brick building with a prominent statue of the Crucifixion outside. Inside, the church is very similar in layout to the Orthodox churches I have visited, with an iconostasis at the front between the sanctuary and the nave, and large icons on the walls. A feature I immediately noticed were the four large screens on the walls – more on these later. The curtain over the entrance in the iconostasis had a transparent plastic sheet over it; I’m not really sure why this was there, and felt it detracted slightly from the atmosphere, as did what looked like Christmas lights placed on one of two almost identical icons of the Virgin Mary at the front. A door led off from the entrance area to an upstairs gallery, and on the right hand side of the church a door led to a side-chapel area of sorts. I think that there was also a vestry area accessible via a door to the left of the iconostasis, but I didn’t get a good look there. The service was led by a priest in white vestments. He was assisted by another man, who I think may have been a deacon, who was also in white vestments. There were roughly twenty (that’s not a typing error; it was near twenty) altar-servers, all men, ranging from middle-aged to no older than twelve – they for the most part stood in front of the iconostasis, chanting the prayers. The congregation was – at least until twenty minutes or so before the end, when the female half became full – segregated between men and women, the former taking the left side of the church and the latter the right side. The congregation steadily grew throughout the service, with people arriving as it went on. By communion, there were just under a hundred people in the church (including the large number of altar-servers). There was something like a 60:40 women-men ratio (again, including the male altar-servers), and most of the men arrived much later than most of the women. Some of the men wore suits, and I noticed one lady in particular wearing a very nice looking, almost robe-like, white dress – for the most part, though, the dress code seemed to be smart casual, although some of the women wore head-scarves. The congregation was unsurprisingly overwhelmingly Middle Eastern, and there was a wide age-range as well. The church’s website stated that the service began at 9 am. I arrived at that time to find the church almost empty, other than two young men near the front, and a lady who was going between the icons at the back praying before them and lighting candles. I was welcomed by those present, and after a few minutes the priest arrived. He said hello to me, and went behind the iconostasis. After a few more minutes, the curtain in the iconostasis opened, and the priest began to pray before the altar. He was praying in Coptic, but the aforementioned screens on the wall displayed the prayers in English, Coptic and Arabic, so that the members of the congregation could understand. I think this is a fantastic touch, as the main problem I have had with other “ethnic” churches I’ve visited has been my inability to follow the majority of the service. The Coptic church is part of the “Oriental Orthodox” or “Old Oriental” family of churches, which broke away from the Orthodox Church in the 400s. Their style of worship is therefore very similar to that of the Orthodox – the service I was attending was the Liturgy of St. Basil, which so far as I can tell is a slightly modified version of the liturgy that Orthodox churches use during Lent. The service was therefore comprised mostly of chanted prayers and hymns from the priest and altar-servers. The two altar-servers joined in with the chanting, and while the priest censed the altar, they produced some cymbals and began to play these along with the chanting. At first I found this rather off-putting, as it somewhat drowned out the prayers, but more altar-severs were arriving and joining those at the front, increasing the volume of the chanting. The cymbals stopped, and some prayers – including the Great Doxology and the Lord’s Prayer – were then chanted in English by one of the altar-severs. I unfortunately thought that these were both rather rushed and mumbled – indeed, had the words not been on the screen, I’d have found it very difficult to actually make out what was being said. It was now 9:15. More altar-servers had arrived, and the Nicene Creed was chanted in English, except for “We look for the resurrection of the dead…” onwards, which was chanted far more slowly and reverently in what I think was Arabic. This was followed by Mark 16:2-8, after which the altar-servers prostrated themselves before the iconostasis, the priest blessed them, and they all went into the sanctuary. There was then a pause in the service of just over five minutes. There were now nine or ten people moving around inside the sanctuary, whereas in the nave, I was one of only four people. On the other side of the church from me, a lady was sitting down, and behind us the same lady who was there at the start was still moving between the icons, and another lady was setting up glasses of water on the windowsills. At 9:33, the altar-servers all came out back on to the raised area in front of the iconostasis, donning white vestments with red stoles while chanting – beforehand, they had just been wearing casual clothes. The chanting was then supplemented again by the cymbals, and now with a triangle as well, until this came to a sudden stop as the altar-servers all pulled out little blue books from which they silently read for a few minutes. The chanting then started up again. If I were to describe every detail of the service, this review would be far too long, so I will summarise the next hour and a half. People continued to enter the church in ones and twos, but for quite some time, every man who entered the church went up to join the altar-servers rather than joining the congregation, so that by the time a second man joined me in the pews, there were already about twenty women on the opposite side. The Coptic chanting continued, often accompanied with the percussion, and with occasional prayers in English. The priest censed the altar and the congregation a few times, and readings were given from John 9, Ephesians 6, Acts 20:1-12, and 1 John 2:7-17. There were certainly a lot of Bible readings, which I thought was great. At one point, 40 “Kyrie Eleisons” were chanted, followed by what I thought was an extremely drawn-out “Amen” but turned out to just be the chanters going “aaa” for about two minutes – I don’t know what this was. As we approached 11 o’clock, the chanting ceased and the priest read an account of the life of a Saint Moses, which was followed by an English version given by the person who I think was a deacon. After this, the Trisagion was chanted, accompanied by the percussion – this was the only time in the service that I saw some members of the congregation cross themselves. After more prayers, there were two more readings: a short passage from Psalm 89, and Luke 5:27-39. It was then time for the sermon. One of the altar-servers announced that an English translation would be given upstairs in the gallery, and so I followed him and several others up there. He translated into English for us what the priest was saying in Coptic. The sermon started off on the subject of the gospel reading we had just heard, the calling of Matthew to become an apostle, but it soon went down several tangents until we were hearing legends about the Holy Family’s time in Egypt. I wouldn’t say that the sermon was rambling as such, but it certainly didn’t have much of a focus. Not that this was necessarily bad, though – the priest managed to cover several topics in a relatively short space of time, all of which were interesting. After the sermon, those of us in the gallery went back downstairs (by now it was about 11:20), and I found that somebody had taken my space while I was upstairs listening to the sermon being translated. This wasn’t much of a surprise, though, as the congregation had greatly swelled during the sermon by about thirty people. Chanted prayers continued now until communion, interspersed with another reading of the Nicene Creed, the sharing of the peace amongst the congregation (this was done in an interesting manner – we kissed our hands and then shook that of our neighbour), and an interesting chant in which the Miaphysite position of the Coptic church (their belief in regards to the natures of Christ which led to the Oriental churches breaking away from the Orthodox/Catholics in the 400s) was clearly expressed. Communion was had in the following manner: members of the congregation would go up to the front, receive the bread from the priest, and eat it with a cloth held over their mouth to prevent dropping crumbs. They would then go to the deacon and receive a spoonful of the wine, and finally have one of the glasses of water which had earlier been placed by the windows to wash it all down. The men went first, followed by the women, which is a practice which I have never seen or heard of before. After communion, prayers were chanted for another ten minutes, although unfortunately the screens only displayed Arabic text for this part and so I didn’t know what any of it meant. The chanting ended, and one of the altar-servers asked people to stay for announcements. The priest then addressed the congregation in Coptic for a few minutes, and the service then ended at about 12:35. The service lasted roughly three and a half hours. Although this church is undeniably “ethnic”, I think that there are enough provisions in place – the sermon being translated into English, several of the prayers and Bible readings being in English, and of course the screens giving translations for most of the prayers – for somebody who only knows English to be able to attend here regularly. Even the length of the service wouldn’t be a problem, as there was clearly no expectation for everyone to be present for the whole service, as lots of people still arriving when there was only an hour or so left to go demonstrated. At the end of the service, members of the congregation went up to the priest at the front of the church and received pieces of delicious warm bread from him. I don’t think this was the same as the Orthodox antidoron (blessed cubes of bread from the same loaf which the bread used for communion was taken from), as this bread had clearly been freshly baked. I was told by the priest that I was very welcome to come again, and was invited by one of the altar-servers to join them in the church hall for food – and by the sounds of it this would have been more than coffee and biscuits – but I unfortunately had to decline due to time constraints of my own.